This is Ambicja and the picture is taken at A&A Arabians. She is a lot lighter in colour these days! Ambicja is a pretty mare that has left good foals. She belongs to the family of Milordka. The sire and dam of Milordka are unknown but the family has always been considered to be Saklawi, imported to Slawuta in 1810. The branch Ambicja belongs to came to Sweden in 1962 when Sakla was imported by dr Arvid Aaby-Ericsson. She was a very rare mare, full sister to Estokada and half sister to Canaria (also imp Sweden) and Sedziwoj. 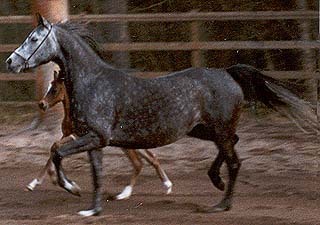 Her daughter Sake by El Trypoli was imported along with Sakla. Sakla and Sake was bought by Blommeröd in 1967. Both mares have given very good offspring in Sweden and this family is one of the most consistent families in Sweden. Sakla's daughter by Cedr, Cesa, was one of the best mares at Blommeröd with daughters like *Cesarzowa, Marcessa, Amurathia, Cesanne and Ceremona. Ambicja's mother Amurathia is by Abu Ali which gives Ambicja another line to Amurath Sahib through Gwarny. The Milordka family has three major branches, that of Anielka 1909, that of Siglavi-Bagdady 1908 and that of Koalicja 1918. Ambicja belongs to the branch of Siglavi-Bagdady. This branch is probably the most important, with individuals like Fetysz, Saga, Canaria (with another line to the Milordka family through Koalicja's son Enwer Bey), Gwara, Cosmosa, Estokada, Celebes, Eskapada, *Elkana and Ekstaza. Ambicja is also connected to the Milordka family through *Cedr who came from the same dam line (he was out of Cosmosa). Through her dam Ambicja has two crosses to Amurath Sahib. She gets another line to Amurath Sahib through *RD Misha's dam *Maritsa who was by Arax.